Choosing the best pond liner material can often be confusing for many customers with so many options available today. Fortunately, due to Western Environmental Liner's extensive 30 year history with various pond liner materials, we are able to select the best pond liner material for each particular application which enables us to provide the best value to our customers. Western Environmental Liner prides itself on never selling a pond liner product that is overkill for an application or selecting a pond material that won't get the job done right. Be assured that we have your best interest at heart. Due to its affordability, in most cases we recommend a reinforced pond liner product for most pond liner applications. These type of pond liners are often lighter, stronger, much more tear resistant, & less expensive than unreinforced pond liners. One thing to note is that thickness does not always equate to quality. An unreinforced pond liner product often needs to be much thicker than a reinforced pond liner to work well. When this extra thickness is factored into the price, an unreinforced pond liner is often more expensive overall. Not every situation is the same though, for instance, when a pond liner needs to conform perfectly to every nook and cranny of a pond, a highly flexible and malleable film such as pvc may be the best option. Large preformed pond liners often produce the best results. For water ponds, the biggest consideration should be if the pond liner will be exposed to the sun or not. Sun exposure to a pond liner is often a necessary evil. Often with large ponds a steep slope is being used which can make covering the pond liner with dirt difficult due to the dirt falling down into the pond and leaving the liner exposed to the sun. Reinforced Polyethylene is normally the best value when the pond liner is not exposed to u.v. rays. Reinforced polyethylene products are very strong and specially formulated. Our reinforced polyethylene pond liners (Aqua Series) can often last well over 20 years buried. Although reinforced polyethylene can last a long time exposed to the sun, they normally can’t be guaranteed to last over 10 years exposed depending on area, so for really long term use this product should be buried. Reinforced Polyethylene can be quite a bit less expensive than liner materials that last 20 years plus in the sun. Reinforced Polypropylene is usually the best pond liner choice for exposed applications. Our 45 mil Reinforced Polypropylene will last over 20 years when exposed for water applications and also works well with many other fluids. Although more expensive than Reinforced Polyethylene, there is no need to worry about the sun’s rays destroying the liner for a very long time. Although we do have our preferences which most often has to do with best value for the customer, we know sometimes other products are specified into a project and we can usually provide those materials as well. We provide liners that are also resistant to oils, chemicals, and waste, but these liner options are not normally described as a pond liner. Due to the fact that Western Environmental Liner is one of the leading manufacturers of pond liners in the world, this enables us to offer large discounts and in many cases, warranty guarantees backed by our 30-year experience in the pond liner industry. Our dedicated staff of pond liner professionals are ready to answer your questions to help ensure you choose the right pond liner for your application. Pond liners can offer an unlimited potential for design, long lasting capacity, and low maintenance cost. 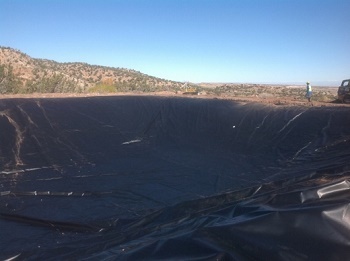 An investment in a high quality pond liner will enable you to have a long lasting containment solution. Please contact us via either e-mail or phone to help you choose the best value pond liner for your application.